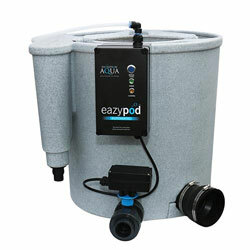 The EazyPod Automatic is a self-cleaning, mechanical and biological filter system for garden ponds up to 2,640 gallons. The integrated control box contains an adjustable timer which initiates a cleaning cycle automatically - meaning your filter will clean itself even when you’re not there! Inside the control box, the electronic connector blocks control the automated waste valve, along with your choice of circulating pump (not supplied). It even houses an integral air pump which kicks in automatically to clean the K1 Micro media. The Eazypod UV Automatic features an integrated 18 Watt UVC built in to the inlet section of the filter, helping to clear green water. Available in 2 models, users can select either the EazyPod Automatic or the EazyPod UV Automatic (with built-in 18 watt UV).